Stockholm offers a wide range of sights, museums and activities for visitors. The Stockholm Visitor Center provides information about interesting sights, activities, restaurants etc. in Stockholm. A travel guide in pdf format is also available from them. Stockholm 3D Free offline map with 2D and 3D view and points of interest. 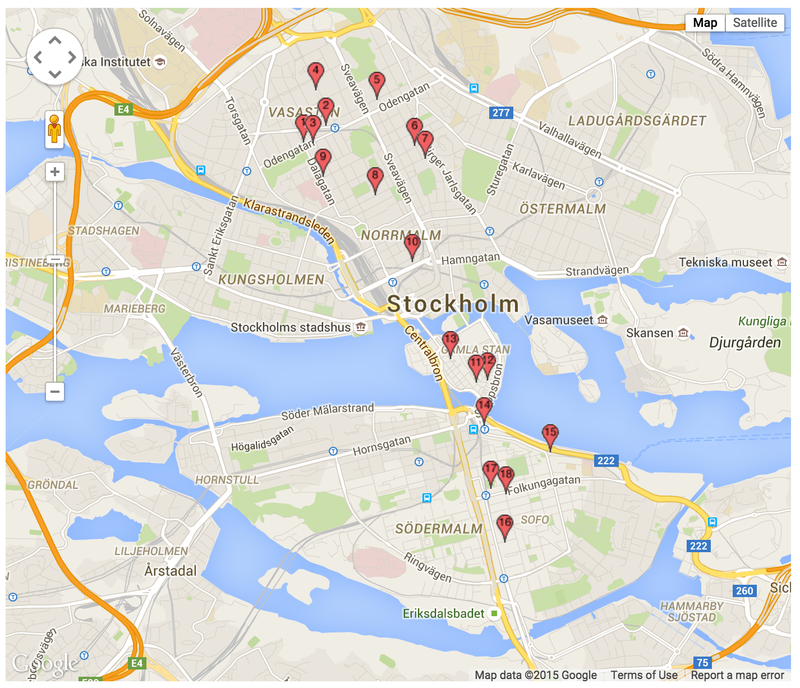 The map below shows some suggestions for restaurants at various locations in central Stockholm. The choice in restaurants is quite large as any place serving alcohol has to have a proper kitchen, so basically any pub or bar is also a restaurant. Stockholm has a good selection of restaurants, both serving Swedish and international food. Traditional Swedish cuisine offers both a lot of fish and meat (pork, beef, but also meat from reindeer and moose/elk). There are many small cheap places doing pizza, kebab or sushi, but they will often have limited seating (mostly take away). Tennstopet Dalagatan 50 (Subway Odenplan). Traditional Swedish food. Has a restaurant and bar part, you can eat in both. Tranan Karlbergsvägen 14 (Subway Odenplan). Traditional Swedish food. Popular place, may be difficult to get places for large groups. Bar in the basement. Ristorante Pompei Odengatan 83 (Subway Odenplan). Fairly standard Italian restaurant in a convenient location. Cliff Barnes Restaurang Norrtullsgatan 45 (Subway Odenplan). Swedish/International. Popular among students. Becomes bar/club later in the evening. Andalucía Surbrunnsgatan 37 (Subway Odenplan). Spanish. Friendly place, sometimes with live music. Farang Tulegatan 7 (Subway Rådmansgatan). Asian/Thai. Best food in town. Expensive, need to book table well in advance. Café Piastowska TegnÃ©rgatan 5 (Subway Rådmansgatan). Polish restaurant, run by a Polish family. Very friendly, with a large basement. Restaurang Jai Thai Kammakargatan 44 (Subway Rådmansgatan, Hötorget). Thai restaurant, formerly known as Sabai-Sabai. Recommended by Lonely Planet. O'Mamma Mia Kungstensgatan 62 (Subway Odenplan, Rådmansgatan, S:t Eriksplan). Pizzeria. They have a separate vegan menu with a large variety of vegan pizzas and some mexican dishes. Sally Voltaire & Systar Drottninggatan 45 (Subway Centralen). Health food. Restaurant in the department store Åhléns. Offers a variety of raw vegan, vegan, vegetarian and seafood dishes, smoothies and green smoothies. Attached is a health food market. Open Mon-Fri 10-21, Sat 10-19, Sun 11-19. Ardbeg Embassy Västerlånggatan 68 (Subway Gamla Stan). Swedish. Good place for reindeer and moose. Restaurant in the back of a bar with whiskeys and Swedish beers. Den Gyldene Freden Österlånggatan 51 (Subway Gamla Stan). Swedish. Old traditional restaurant dating back to 1722 with medieval cellars. Expensive. Hermitage Stora Nygatan 11 (Subway Gamla Stan). Vegetarian. All-you-can-eat buffet for SEK 110 including salads, several warm dishes, bread, water, tea. Usually everything except one warm dish and one salad or so is vegan. Omnivores generally like it, too. Gondolen Stadsgården 6 (Subway Slussen). Swedish/French restaurant with a spectacular view, located 33m above the water at Katarinahissen. Expensive. Hermans Fjällgatan 23B (Subway Slussen, Medborgarplatsen). Vegetarian restaurant with a spectacular view over Stockholm. All-you-can-eat vegetarian buffet including bread, water, coffee and tea. During summer they may have barbecue in the garden. Most dishes are vegan. They also have great raw vegan desserts. Pelikan Blekingegatan 40 (Subway Skanstull, Medborgarplatsen). Traditional Swedish large beer hall. Kvarnen Tjärhovsgatan 4 (Subway Medborgarplatsen). Traditional Swedish large beer hall. Soldaten Svejk Östgötagatan 35 (Subway Medborgarplatsen). Czech. Popular place to go for beer and Schnitzel, and they also offer vegetarian alternatives. The official currency it the Swedish Krona (SEK). Almost anything can be paid by credit card, so you do not necessarily have to change money. Some places only accept credit cards and no cash. Very few places accept cash only (e.g., public toilets). If you use a foreign credit card without PIN code to buy something, you might be asked to show your passport. What they are looking for is your personal number. At less touristy places people might be a bit puzzled if you do not have a personal number, but it is usually sufficient to show them your date of birth on your passport.